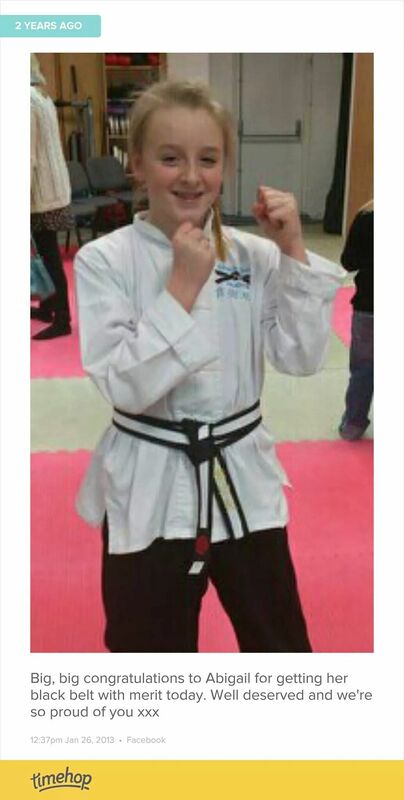 She’d attended Chi Wai Academy twice a week for all those years, working solidly through her belts and badges. Rarely complaining. Always disciplined. Impressing us and her peers with her determination, skill and flexibility (touching her toes to the back of her head was a particular feat)! And finally, on 26th January 2013, we attended her grading, along with other parents, where she got the chance to take on the Sifu himself to demonstrate her skills. 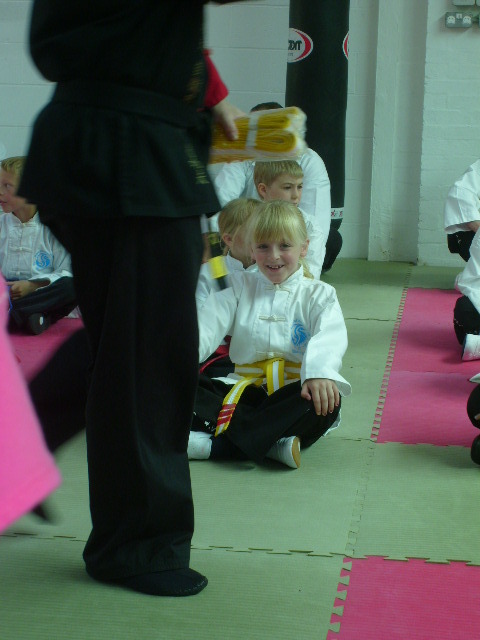 As an incentive, we said we’d give her £100 as a reward for achieving her black belt and, while getting the belt was reward itself, this was recognition for the years of discipline of doing the club twice a week. She spent some of the money on a new school satchel and some on two Robo hamsters (Bella and Pixie) and a second-hand cage for them. The rest she was saving. Robo hamsters are tiny and supposed to live for 18 months. Pixie died at 18 months old but Bella is still going strong two years on! We call her Super Gran! For just two weeks after this she attended senior classes, working with adults, and we were pleased she wanted to continue. She was so proud of her belt. She’d even (reluctantly I should add!) used her skills to warn off a boy who had been picking on her for months. Nothing too traumatic, just a flick of the wrist which meant she was left alone, which was what it was about. I recall it distinctly. At the time wondering how on earth she could be thinking that. At a time like this! But then later, after, I saw the situation through her 10-year-old eyes. Abi had achieved one of her many dreams. She’d worked so hard. She could be at peace. If she’d died a week or day before, the loss and devastaion would still be the same, but we’d also be sad that she missed her grading having got so close. My daughter was right. And it showed me just how straight thinking children are. Being frank has helped us and them a lot in their grief. We debated what to do with her beloved black belt and decided to put it in her casket with her. She earned it, it could go to heaven with her. It was hard to let it go but it seemed the right thing to do. Thankfully the club donated another belt, a personalized one, which we keep with her things. 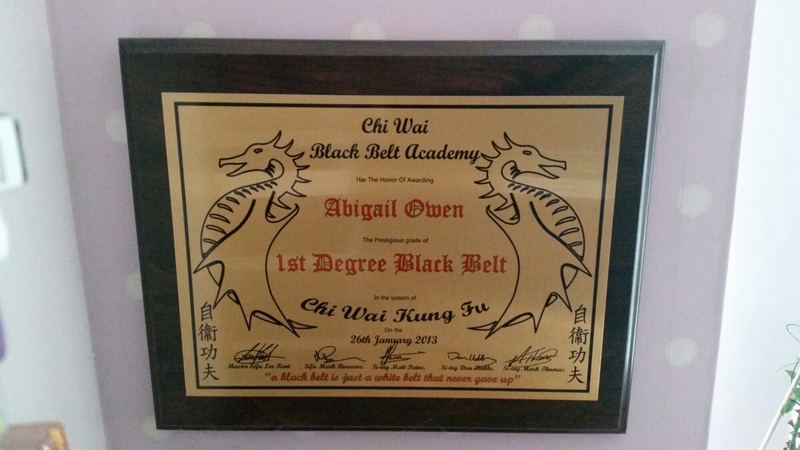 We also keep her black belt plaque on the wall in her bedroom, as a reminder that she was fit and healthy. That any of us can work hard to achieve whatever we want in life. This entry was posted in Life with grief, Remembering Abigail and tagged child bereavement, grief by Chasing Dragonflies. Bookmark the permalink. How saddening and yet how lovely that this has turned into a positive memory of Abi and a wat for you to remember her strength and determination. My oldest (seven) is currently doing basic martial arts classes, and I get an immense sense of pride as I watch him progress. Thanks Tim. Our 7yo has also just started, though at a different club (I think he needed to do something different) but he loves it. My other daughter also has her black belt but she swapped that for pony riding! Since Aidan died, my children( although 15 and 17 years old) talk about all the amazing things that Aidan did in his twelve years. I often wish I had that perspective more, Although I witness their profound sadness each day, they always remind me of how good it was. The smile on Abi’s face is priceless. What a joyous day for her ( and you) Kyle and Molly keep telling me- remember the joy! I’m trying.